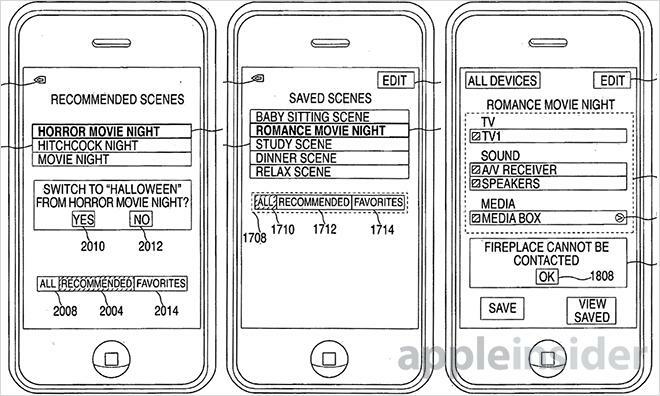 An Apple patent published by the U.S. Patent and Trademark Office on Tuesday describes a method in which a portable device, like the iPhone, can save, manage and recall entertainment and "smart home" system settings, called "scenes." Apple's U.S. Patent No. 8,519,820 for "Systems and methods for saving and restoring scenes in a multimedia system" was first filed for five years ago by the developer who coded the first iTunes Remote iOS app, Alan Cannistraro. While Remote has become a powerful app that controls not only an iTunes library, but the Apple TV as well, Cannistraro's scene capturing patent is on a completely different level. 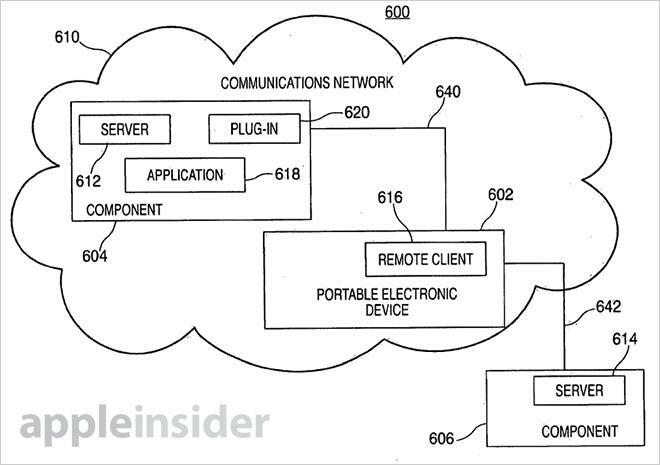 What Apple proposes is a software driven intelligent universal remote that can connect to multiple A/V components, as well as "smart home" devices like lights and window shades, via Wi-Fi, Bluetooth or other wireless protocol. As noted in the document, regular universal remote controls allow for scene selections, such as "play game" or "movie," but the devices are unable to intelligently suggest television, stereo or lighting settings. In addition, users must first set up what components are in the entertainment system, specify the settings for each "scene" and finally activate said scene. To ease the burden of manually configuring the remote, the portable device receives information broadcast from separate components regarding their operating states. For example, the volume and fade settings from an amplifier can sent to the device and saved for later retrieval. Both software and hardware settings are supported, including what media is playing. Scenes can be adjusted as necessary and users can select their own saved scenes or create new sets via a common user interface. Further, the system can detect usage patterns and metadata associated with a certain scene, offering settings recommendations when appropriate. As for usage patterns, the system can track the times and frequency that a saved scene is accessed. For example, when a user turns on the multimedia system on a Saturday, the system will search for and recommend a scene that is frequently accessed at that time on that day. For metadata, the system can detect identifiers like "horror movie" or the name of a song, then search saved scene data for a settings list that best suits the genre. Users have the option to accept or deny the recommendation. In some embodiments, the system allows users to stop and restart media when they move from one position in their home to another. If, for example, a horror movie is playing on one television and a user moves to another television, the system can recognize the switch and recommend playback be restarted from a selected scene. This swap changes the scene at the second television, from the point at which the media stopped to component specific hardware and software settings. In yet another embodiment, the system can wait until a commercial break is detected to display scene recommendations. While the remote control method would be helpful for many iOS device users, the possibility of its implementation remains uncertain. To operate efficiently, each component, including the television, must be able to broadcast identifier settings, as well as receive and respond to signals over a wireless network. The patent language notes wireless bridges can be used between connected devices and those without access, though compatibility may be an issue for older hardware. 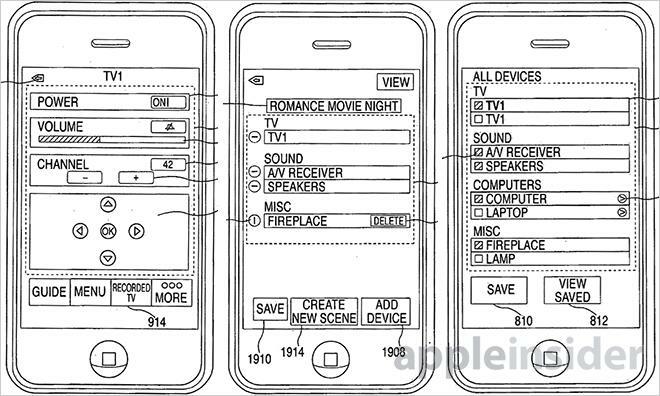 Cannistraro first filed for the universal remote patent in September 2008, but much of the technology described has yet to make its way to an Apple device.